At least 48 people have been killed and around 23,000 forced from their homes by heavy flooding in Malawi, the country's leader said on Tuesday. 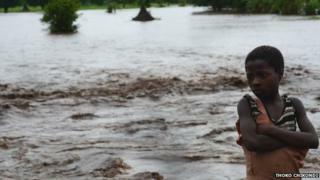 Reports from neighbouring Mozambique said a group of 25 schoolchildren were swept away by floodwater on Monday. Mr Mutharika said his government alone did not have the money to cope. One government official said many victims died when villages were flooded in Mangoche district, an area in the south about 100km (60 miles) south of Blantyre, the commercial capital. "People have fled into schools and churches on higher ground, others are in the open because there is not enough space,'' said Grey Mkwanda, a district planning officer, speaking to the Associated Press news agency. According to the city's police spokesman, Elizabeth Divala, search teams are still looking for two children who went missing during the floods.